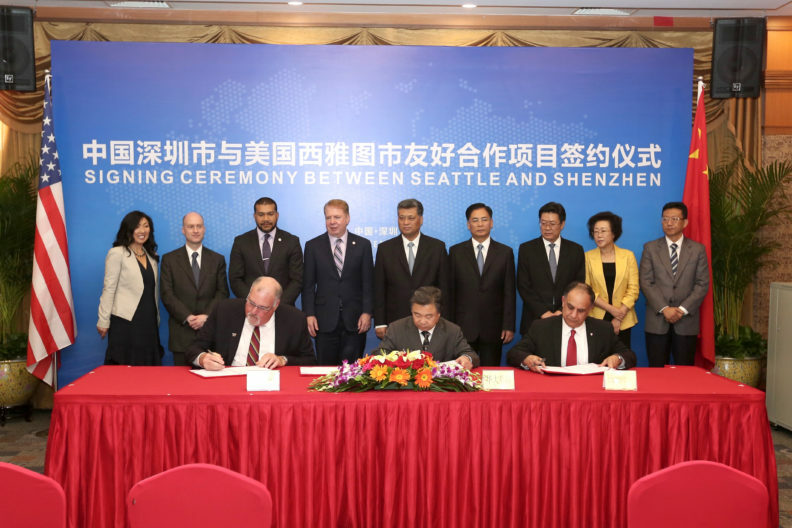 SHENZHEN, China – Washington State University and BGI signed a Memorandum of Understanding regarding basic and applied research in agriculture, Wednesday. The MOU was signed by WSU Vice President for International Programs Asif Chaudhry and Dr. Huanming Yang, Chairman of BGI. According to the agreement, WSU and BGI will cooperate on a strategic level in efforts to establish and conduct programs and activities of basic and applied research, technology and information transfer, and economic development. WSU, founded in 1890, is a top-tier research institution, ranked by the Carnegie Foundation as a “highest research activity” university-the highest classification. It has more than a century of excellence and fulfills its mission as Washington’s land-grant research university by providing educational opportunity, responding to the needs of Washington state through research, instruction and outreach, and contributing to economic development and public policy. WSU is committed to the pursuit of inquiry and discovery and applies knowledge through local, national, and global engagement to improve quality of life and enhance the economy of the state, nation, and world. BGI is the world’s largest genomics organization with focus on research and applications in the healthcare, agriculture, conservation, and environmental fields. The recently established BGI Agriculture Group has an extensive scope, including animal and new plant variety development, plantation, livestock breeding, agricultural product processing, and circular ecological research and application with the aim to establish sustainable agricultural industry and guard national food security.